-Alice in Hell was Roadrunner’s largest selling debut at the time, selling over 250,000 records. 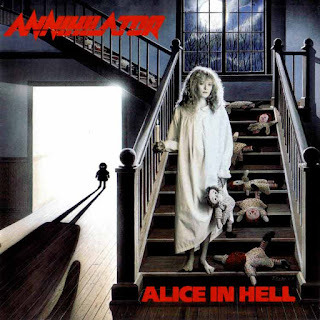 -Although original singer John Bates left Annihilator in 1985, he is credited as the co-writer of “Alison Hell”, “W.T.Y.D.”, “Burns Like a Buzzsaw Blade” and “Human Insecticide”. -The sleeve pictures a five-member line up. However, in interviews, Jeff Waters revealed that this was at the behest of the record label, while actually he played the guitars and bass himself. Recorded and mixed at: Live West Productions Fiasco Bros. Studios, New Westminster, B.C., Canada. Mastered at Frankford / Wayne. All lyrics on this site are property of their respective copyright holders. This site is ONLY for private, educational and research purposes.